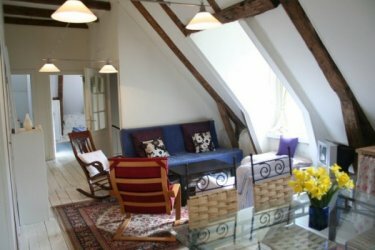 A lovely 'shabby chic' attic apartment, flooded with light and featuring massive hand-hewn exposed beams, higgledy-piggledy antique floor boards and views out over the town to the volcanic coutnryside beyond. A large central lounge/diner/kitchen creates a relaxed convivial atmosphere. Well equipped despite the rustic appearance, it can comfortably seat up to 9 people on comfy sofa and chairs as well as seat them at the dining table which will be provided in a size and with sufficient chairs for whatever the number in your group. Three bedrooms mean you probably won't need to use the comfortable sofa bed. 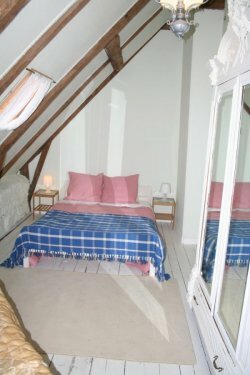 There are two double bedrooms, each with room for a baby's crib (supplied) and a really large room which is currently set up as a triple bedroom but can easily take two double beds, or a double, a single and a child's cot. The large family bathroom has a w.c., good sized handbasin, big bath with rounded shower end and rigid curved glass shower screen over. A big heated towel rail keeps the bathroom cosy in winter, while all the bedrooms have excellent quality electric radiators and the living area has a gorgeous woodburning stove (logs supplied) which creates a romantic and cosy ambience if the mountain air turns chill. Situated only a few moments walk from all of the main attractions of the town, you can eat, shop, take a riverside walk, visit the Casino or have some luxury spa treatments and never be further than three hundred meters from home. Add a little more distance (still comfortable on foot, even in high heels) and you have the church, the Grande Thermes for volcanic spa treatments, museums and a gorgeous big park which is the hub for children's activities during the school holidays and a haven for wildlife. 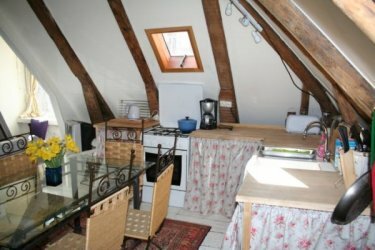 Very much a town that time forgot, quintessentially french, but with everything you need for modern living, rather like the apartment which is as well situated for winter ski parties as it is for multi-generational family holidays. Pets are welcome too, and other than sea-fishing you will be hard put to find an outdoor activity not catered for within walking or easy driving distance of this gorgeous and relaxed little town. 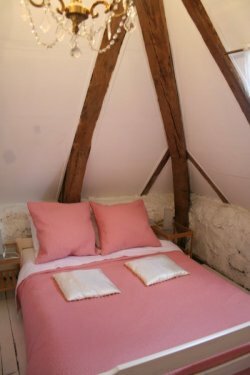 Contact us for last minute, not full week, non Saturday to Saturday, long stays or even odd days and weekends, if the apartment is available we will offer a price to fit your budget if we possibly can. There is an automatic 10% discount for payment in full when confirming reservation.